Sloane moves from New York to sunny Florida with the hopes that her father's career will be revitalized. He is a famous author, think Nicholas Sparks, and is in a bit of a writing slump. Sloane has never really had a crew of friends before, that is until she meets Vera and Gabe. Vera and Gabe are twins and Gabe is the strong and silent type and Vera is completely the opposite. She is a charismatic lesbian with a huge social media following. Through Gabe and Vera, Sloane meets Remy, who is struggling with a recent breakup, and Frank, the town's social director. Sloane slowly becomes a part of this crew and when she finds out that Vera and Gabe's stepmother gave away an important painting their deceased mother painted, she wants to make things right for them. Along with Remy, she tries to track down the painting, but this task is much more challenging than she thought and leads to a series of adventures. I absolutely loved the character of Sloane in This Adventure Ends. She is so witty, funny, and trying to find her way in life. I loved her crew of friends in this novel, so much so that I wanted to be a part of their inner circle. Mills excels at characterization and that is very apparent in the well-rounded character of Sloane. Even Vera and Gabe are fantastic characters and I was just as invested in their sub-plot as much as Sloane's. I love that Mills incorporated a good familial relationship in This Adventure Ends. I adored Sloane's talks with her dad. It was nice to see a strong father figure in YA literature, which we don't see very often. Her dad's new found interest in a paranormal werewolf show had me laughing out loud, but I loved his commentary on life and writing when discussing the show in way more depth than it probably deserves. But he is not some "perfect" person by any means. He is dealing with his own issues surrounding his career, which I appreciated as well. Sloane's adventure to find the painting was entertaining and although I had to suspend my disbelief from time to time, this wasn't was stood out to me the most. It was the relationships and characters that really tugged on my heartstrings. Even the secondary character of Frank, the social coordinator of the town, was fantastic. He's such a fun character; I want to hangout with him. He was larger than life, so it was no wonder that he had a huge following. Can I please attend one of the Frank sanctioned parties? What Mills excels at the most is her characterization, as I said before, as well as the dialogue in This Adventure Ends. I could listen to her character's dialogue all day. I am not sure many teenagers talk like this, but it was so entertaining and hilarious. It reminded me of John Green's dialogue, which I love. It was smart, witty, and honest. Mills is quickly becoming one of my favorite YA authors. If you enjoy Emery Lord and John Green, I encourage you to check out Mill's work. It's smart, it's moving, and the dialogue will have you grinning from ear to ear. 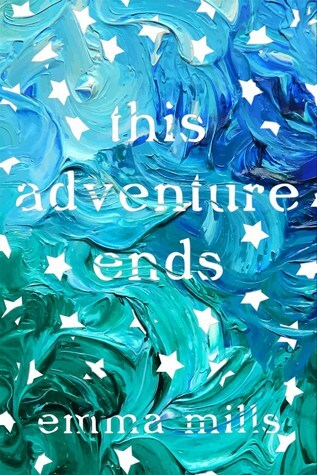 This Adventure Ends is most definitely one of my favorite books of the year. Great review! I'm totally a sucker for good covers, so I have been contemplating picking this one up - but I don't read YA very often. After reading your review it sounds like this one I should read! Definitely going to be checking it out! Thanks, Katie! I hope you enjoy it! I recommend First & Then as well. Thanks for visiting! Fantastic review! This book sounds wonderful and I will definitely be reading it. I really like the portrayal of strong friendships in books and the characters sound appealing. I think you'll like this one. I look forward to your thoughts. Thanks for visiting, Christina!